It's not often we visit the Topshop website without racking up a wish list as long as our arm. In fact, there are so many covetable items dropping each week it seems we're regularly curating the perfect wardrobe in our virtual baskets. This kind of constant perusing (rather than fast purchasing) can help you really pinpoint what you actually like and are willing to spend some money on. Of course, we can always rely on Instagram to guide us in the direction of potential sell-out pieces, and then, of course, there's the helpful "Trending Product" tag to look out for on the new in section, but we went one step further. Our fashion editors got in touch with the Topshop team to find out what everyone is obsessed with, and they picked five key buys for autumn/winter 2018. 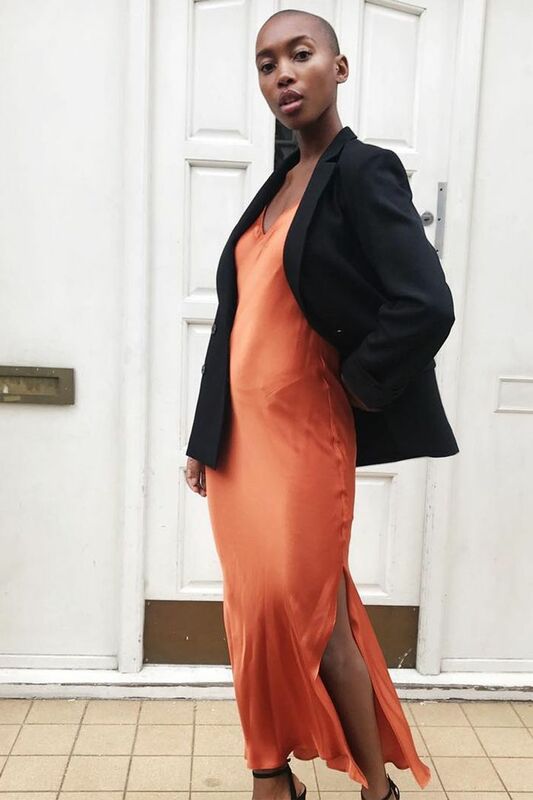 We knew that £29 slip skirt, which sold out as soon as it hit the virtual and real-life rails (or Monikh Dale's Insta Stories), would be on the list. It has already sold out online in black, rust, burgundy, olive and navy, but if you haven't nabbed it already, we've been told they will be restocked soon. In the meantime, you can get the new ochre shade, here, and the fierce tiger print, here. We've all seen Topshop's satin slip skirt doing the rounds, but now everyone is snapping up the dress version, too. It's so versatile you'll want layer it over a roll-neck with slouchy knee-high boots for day or add mules and a baguette bag for evening. You can also layer it under every chunky knit going at any given opportunity. Marisa is wearing her rust number with a chic blazer. It's in the tall section, so this one is perfect if you like your dresses slightly longer. We feel like the beaded bag has reigned supreme this year, and it's not going anywhere just yet. The high street has managed to create a whole army of iterations that rival the designer versions, and the Peggie is one of them. Pearl-like beads, a cute round handle and the perfect 24/7 size are just some of its USPs. Topshop has told us it's already selling out quick, and they've seen a huge hype around it on social. Scroll down to shop Peggie and her pals. We can rely on faux fur to make a reappearance each year as soon as the chill sets in, but this year it's all about the Borg. It may look like shearling, but it's completely faux. You've probably spotted them on every street styler going, and who can blame them when they're this chic and cosy? Our friends at Topshop let us in to a little secret that the cream, super soft option is set to be the next favourite. We all remember that monochrome spotty Topshop dress that sold out in record speed and appeared at every wedding in the summer, right? Well, now there's a more wearable autumn/winter version in the form of a midi shirtdress. Our insider told us that the heart button-through is the next big thing. (P.S. there's also leopard, poppy and paisley options to choose from). We might be well into winter, but we're always on the lookout for new boots. Enter: Topshop's animal print offering, that are so chic they're permanently on the trending product list. Whether you go for snake, zebra or keep it classic with leopard—any print goes. Make like stylist Lison and team them with simple separates to let the boots do the talking. Want even more Topshop? These are the key items we've picked from the sale.